When it comes to shopping for baby and toddler items, it can be easy to put off the more practical pieces — like the best double strollers, the greatest highchairs, and safest car seats — in favor of browsing for the cutest kids’ clothes. We get it. There’s a lot of research that goes into making the more significant-item decisions, from the price points and materials to the overall safety ratings. 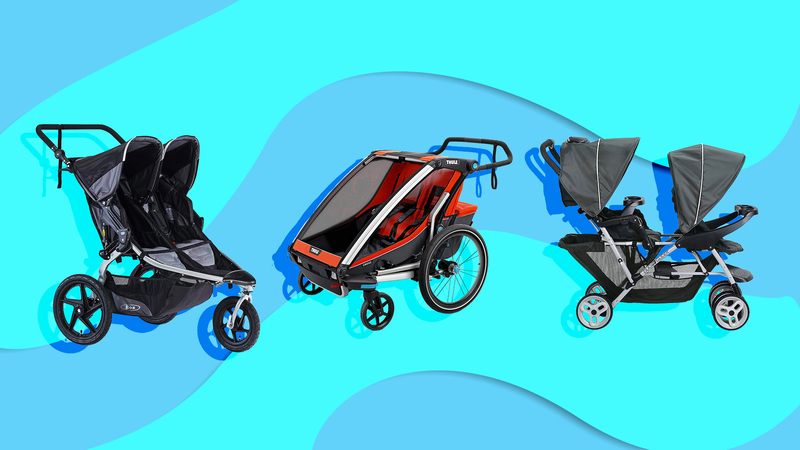 But moms of two kids are in luck: To make shopping a bit easier for you dear overtaxed parents, we’ve compiled a list of some of our favorite double strollers on the market in a variety of models and prices. How will you use your stroller? Are you just planning on taking your kids out for a meander in the park, or are you planning to do more intensive exercise like jogging or biking? Are you going to be packing the stroller into your car often, or will you primarily use it and store it in its fully assembled state? Knowing the answers to these questions will help you better navigate and narrow your options. Who’s using the stroller? Are your children different ages, or are they twins? Is one an infant and the other a toddler? Are they both toddlers? If your kids are a couple of years apart, ask yourself how often the older child will use the stroller and in what capacity. Would they prefer to stand in the back or sit? While many models on the market accommodate two infants or two toddlers, some are better equipped for children who are further apart in age (for example, a six-month-old and a three-year-old). What are some must-have features you can’t live without, and how much are you willing to spend? Like all kid-related goods, double strollers can drastically range in price. Yes, you will be tempted by the double strollers that promise everything. But don’t automatically assume that the most expensive or flashiest option is the best for you. Figure out which features you need first. Some examples could include car seat compatibility, adjustable handlebars, or an ample amount of storage. Then, you can figure out which options have what you’re looking for and if you can — or want — to upgrade. This double jogging stroller has a massive fan base, and with so many great features, it’s easy to see why. For starters, the handlebars have nine adjustable settings, so parents of different heights can quickly adjust to suit their needs on the go. It may sound like an unnecessary convenience, but you’ll appreciate the flexibility. One common complaint parents have about double jogging strollers is that they typically come with the seats positioned side-by-side. The Baby Jogger City Select Lux changes things up with its in-line (or tandem) design, where two infants, two toddlers, or an infant and a toddler can comfortably sit in stadium-style seating (these seats hold up to 45 pounds each) while you adventure. Plus, the company says there are 20+ seating configurations for you and your kids to optimize comfort. Some include both kids facing forward, both kids facing you, kids facing each other, and kids facing back-to-back. The stroller can also accommodate car seats or prams for babies. For older kids, you can purchase a bench add-on that they can use to stand. The UV50+ canopies include peek-a-boo windows, and the wheels have suspension for a smooth ride. The Lux also promises to be more compact than the regular City Select model, to make storage a breeze. Like many of the other in-line models, the Vista offers a variety of configurations so that your kids can switch up their views whenever you please. Parents with infants can purchase an UPPAbaby Mesa car seat and adaptors, which easily clip into the stroller (you’ll need two if you have two infants), or other compatible car seats. The model shown here comes with one bassinet, so parents of twins might consider buying one more — yes, this stroller can actually fit two! This stroller doesn’t skimp on storage, either. In addition to the below-the-seat storage net, the BravoFor2 comes with child and parent snack trays to keep things organized. Parents report that the stroller is also easy to fold and transport between uses. There are a lot of great features, though. Each of the seats reclines individually, and kids have ample leg room to wiggle. You can also remove the bumper bar in the front if kids want a bit more space. The storage is also phenomenal, with a vast undercarriage and mesh pockets lining both seats — plus, the double wheels in front reportedly increase the stroller’s maneuverability. But perhaps the best part about this stroller? It can fit through the doorway no problem, as it measures only 30 inches across. The Graco DoubleGlide Click Connect is the least expensive stroller on this list, and it also has some of the best reviews. This stroller can accommodate infants and toddlers (up to 40 pounds each) and is compatible with the Graco SnugRide Click Connect car seat. Each seat can recline, and the backseat can even hold a bassinet (Sorry, twin parents: This model can only fit one bassinet at a time). Keep the kids’ snacks organized with two snack trays (plus one for you, duh) and feel good knowing the canopies will protect their little heads from the sun. Unlike some models, the stadium seating is fixed in the DoubleGlide Click Connect, so both children have to face forward. Happy shopping — and adventuring!